A MOBILE phone rings as Chicka Dixon is talking on the landline. "What's that? That's bloody ASIO, is it?" the 79-year-old says. With a 30-year embargo now over, Mr Dixon has in his hands 150 often tedious, sometimes frightening and occasionally humorous pages of his ASIO file from the 1960s and '70s, when he was one of the leaders of the indigenous rights movement. Mr Dixon was instrumental in the decade-long campaign for the 1967 referendum to include indigenous people in the census, the erection in 1972 of the tent embassy in Canberra, and in setting up the first Aboriginal legal and medical service. In pages and pages of typed agents' reports, however, the man they called "The Fox" is painted as a "popular, well-dressed and strongly anti-European" dissident. "Dixon could be a communist or is certainly very close to becoming one," one item says, because of his union background. "He is an Aborigine," it adds, almost as an afterthought. The file's existence came as no surprise to Mr Dixon, who routinely asked spooks to photograph "his good side" or began phone conversations by saying: "To those who are tuned in, we are now on air." But some of the file's contents were less predictable. "There are lots of errors," he said. "They said I'd contacted someone in Victoria to go to China with [an Aboriginal delegation] in 1972. I'd never heard of him and I hand-picked the delegation. "All they had to do was ask me. But they're spooks, they can't do that. It made me laugh." Several of Mr Dixon's peers, such as Charles Perkins, Faith Bandler and the Melbourne academic Gary Foley, also have ASIO files. Mr Foley says the files highlight the "sheer incompetence of these idiots in analysing anything outside of their own culture" - as came to light again this year in the debacle surrounding the Indian doctor Mohamed Haneef. "It's not comical," Mr Foley said. "We were accused of a plot to blow up the 28-storey headquarters of the Department of Aboriginal Affairs in Canberra. I knew nothing of this until I read it in my file a couple of years ago." Fortunately, the public do not have to rely on spy agencies for a visual history of an era when the first Australians were given the vote, citizenship, census status and bespoke services - to say nothing of access to shops, cinemas and restaurants. Juno Gemes's Proof, an exhibition of portraits commissioned by the National Portrait Gallery in 2003, opens at the Museum of Sydney today with a conversation between Gemes and the NSW Minister for Fair Trading, Linda Burney. It features Mr Dixon, Mr Foley, Ms Bandler and others such as Ernie Dingo, whose 1994 TV program Heartland broke new ground by portraying him in a relationship with a character played by a young Cate Blanchett. 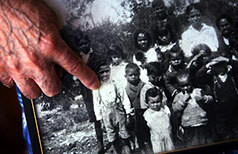 The director of the Portrait Gallery, Andrew Sayers, said Proof was a rare insight into key players in modern Aboriginal history. Gemes, who has photographed indigenous Australians for 30 years, said it showed how the nation's Aboriginal leadership had changed. "I don't think people such as Noel Pearson would be where they are now without the movement. He's standing on their shoulders, even though he has become a right-wing ideologue." or five MPs, like I did in Darwin recently. I nearly cried. So it's not all bad, we're getting there."